Property 5: We Are 20 Miles From The Taos Ski Valley And 1.25 Miles From The Center Of Town. Property 7: Casita De Montoya- walk to historic Taos Plaza! Property 16: Historic charm of old Taos with modern amenities. Very best location! Property 17: Cozy Casa Carmelita features a Brilliant Kiva Fireplace, Unique Patio & Hot Tub! Property 20: Best Street In Taos! 2 Blocks To Plaza! Steps From Kit Carson Park! Property 22: A Hidden Jewel Next To The Plaza. Property 24: Rustic & Charming Taos Get Away! Beautiful Taos Guesthouse on Quiet Gated Compound! Property 30: Beautiful Taos Guesthouse on Quiet Gated Compound! 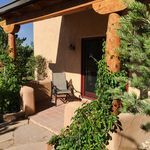 Property 32: Historic 1640's Taos Adobe- Perfect for Couples! Booking for Ski Season! Property 36: Escapada De Montoya - walk to historic Taos Plaza! Property 37: Jewel of the historic district! Exceptional, beautiful casita! Totally Taos!! Property 38: Springtime in Taos... Enjoy downtown festivities!!!! Property 43: Historic Home of Taos Artist -Charming Ambiance and Very Best Location! The owners of this idyllic Taos guest house have thought of everything. Sacrificing none of the building&rsquo;s classic adobe charm&mdash;viga ceilings, white-washed plaster walls&mdash;their recent renovation has created a beautifully designed, serene modern space on one of Taos&rsquo; prettiest streets. A courtyard shared with the owner&rsquo;s main home is shaded by huge cottonwoods and features a small stone fountain and candlelit wall niche. The living room, bedroom and contiguous sitting room all feature crank-open windows, and the breakfast room opens onto a backyard patio with gas grill and apple tree. Thoughtful details include a kiva fireplace stocked with pi&ntilde;on wood, a bottle of wine (and milk for coffee) chilling in the sleek IKEA kitchen&rsquo;s mini fridge, and bath amenities from a New Mexico organic lavender farm. We can&rsquo;t wait to go back!! We had a great time in our week at the casita. While hiking, rafting and sight-seeing were awesome, some of our favorite time was relaxing on the back patio in the morning. Judy and Alden made us feel welcome the entire time. We had fun visiting with them - and even some of their local friends!